Choose from 23 hotels and guest houses in Greater London. Shown below a just a selection of the hotels available. To search within an area please use the menu on the right. Comfort Hotel Harrow has a quiet location in the London suburb of Harrow, walking distance from Harrow town centre, the Underground and main line train stations. Ideal for business and leisure, Comfort Hotel Harrow is 20 minutes from Central London by train, and 12 miles (19 km) from London Heathrow Airport. Wembley Stadium and Arena are 2 stops away from Northwick Park Station. 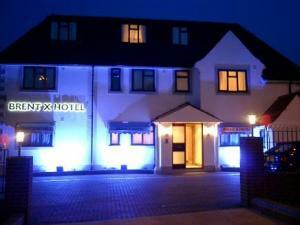 The hotel has easy access to the M1, M40 and M25 motorways and has plenty of free car parking. Dining options include Seasons Brasserie, open daily for buffet breakfast and dinner, and Seasons Lounge Bar which offers relaxed dining in an air-conditioned environment. A 2-minute walk from Richmond Park and 7 miles (11 km) from London's West End, Kingston Lodge has excellent travel connections and free parking. Heathrow Airport, the M25, M3 and M4 are all accessible from the hotel. Norbiton Train Station is a short walk away. Kingston Lodge, a Brook Hotel, is walking distance from fashionable Kingston town centre. Many rooms have their own balcony and overlook the peaceful courtyard garden. Dinner is served in the conservatory-style Atrium Brasserie. A varied menu is served in the lounge bar. 24-hour room service is available. Richmond Hill is 7 miles from Londons West End and within easy distance from London Heathrow Airport. There is an overground and underground connection from Richmond Station which is short walk away. The Hotel is opposite the famous Richmond Terrace with amazing views over the meandering River Thames. Richmond Park with herds of fallow deer is beautiful at this time of the year, particularly at sunset, is only a 2 minute walk from the Hotel entrance. The fashionable town centre of Richmond Upon Thames is a short walk away with its array of boutiques, caf? 's and bars. Richmond Hill Hotel is ideally located for visiting the attractions of West London and Surrey, including Twickenham Rugby Ground, Wimbledon Tennis, the new Wembley Stadium, Kew Gardens and Hampton Court Palace. Extensive, meeting, events and conference facilities makes Richmond Hill Hotel the ideal venue in Surrey for your conference, wedding reception and other special occasions. BT Openzone Wireless Broadband Connectivity is available throughout the Hotel. There is also ample free car parking available within the Hotel grounds. Use of Cedars Health and Leisure Club, adjacent the Hotel, is complimentary to residing guests. 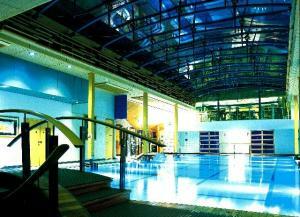 The superb facilities include pool, gym, spa and beauty treatments. Close to London Heathrow Airport, this cosy Victorian hotel is also just a 5-minute train ride from Twickenham rugby stadium and 5 minutes from Bedfont Lakes. Most rooms at The Ambassador are en suite and the furnishings/linen are of a high standard, with Egyptian cotton linen on the beds. Rooms are equipped with modern facilities including flat-screen TV. 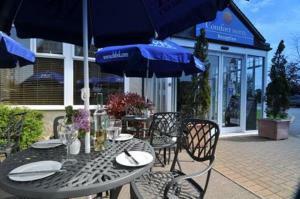 Full english breakfast is included in the price, along with free Wi-Fi and free car parking. The Ambassador Heathrow Hotel is to the standard of a large, corporate hotel, but with the familiar and comfortable atmosphere that only a small, independant property can offer. A 2-minute drive from Hampton Court Palace and its wonderful home park, where the deer run wild all year-round, this charming hotel and pub integrates traditional historic features with a contemporary feel. With half-timbered and leaded windows, the White Hart is one of the most striking buildings in the Kingston area. It has a large, popular pub and restaurant, with a great reputation for service and quality. The secluded accommodation is to the rear overlooking our secure car park. All 37 bedrooms are furnished and fitted to the high Fuller's Hotels specification. All of rooms are non-smoking, and complimentary high-speed wireless broadband access is available throughout the entire hotel. During your stay you can easily visit Sandown Park and Kempton Park racecourses, or Twickenham Rugby Ground and Wimbledon Tennis Club and Museum. Chessington World of Adventures is a short drive away and the vibrant shopping hub that is Kingston upon Thames is close by. London Heathrow Airport is also just 6 miles away. This 4-star hotel gives you high-standard rooms with easy access to London Heathrow Airport, including Terminal 5, all just a short journey from Windsor and central London. At the Sheraton Heathrow Hotel, you won't need to spend time waiting in line at the airport: new online flight check-in terminals allow you to check in and print your boarding pass at the hotel. Relax in the new club rooms, with the king-size Sheraton Sweet Sleeper (SM) bed. Enjoy an LCD-screen TV and access to the Club Lounge, which includes private hotel check-in. Breakfast, evening canap?s, all-day refreshments and free internet access are all part of the club package. Enjoy 45 minutes free Wi-Fi internet access with The Link @ Sheraton from one of the hotel's PC workstations, or from your own laptop. Set in a full 2 acres of well tended gardens, the Bromley Court Hotel is located in the London borough of Bromley, offering easy access to the centre of the capital. With good access to all of the area's major transport routes, the Best Western Bromley Court Hotel has 114 non-smoking, air-conditioned en suite rooms. The hotel's excellent facilities, include a leisure centre with a gym, a spa pool and a steam room with fibre-optic lights. There are also 9 air-conditioned conference rooms and 4 air-conditioned banqueting suites. The air-conditioned garden restaurant and conservatory offers an extensive variety of dining options, from weekday lunches and dinners to Friday or Saturday evening disco dances and family Sunday lunch and dinner options. The Bromley Court Hotel has been assessed under the national accessibility scheme and has been awarded level 2 in mobility, level 1 in hearing and level 1 in visual. Forest View is a well-established, independent hotel just 15 minutes from the West End by Tube, with free, secure parking and a full English breakfast to start the day. Inspected by the RAC, AA and English Tourism Council, the hotel is ideally situated for both business travellers and tourists, with a friendly licensed bar to unwind in. Whether you're visiting London landmarks, shopping or on a business trip, the West End can be reached via a Central Line Tube from Stratford Station, or 30-minute bus journey on bus number 25 (a 24-hour service). There is a choice of high-standard, en suite rooms, from single rooms to large family-size rooms for 4 people. Attractive tariffs, helpful, friendly staff and a warm atmosphere will contribute to a successful trip. With free parking and comfortable, modern air-conditioned rooms, the hotel is just metres from South Ruislip Station, which offers fast, direct services to Wembley and central London. The Days Hotel London - South Ruislip has a convenient location, with the M25, M40, M4 and M1 motorways all within 10 minutes' drive. London Heathrow Airport is only 8 miles (13 km) away. South Ruislip Station is on the Central line of the London Underground network, just 30 minutes from Oxford Street. The station also offers regular direct National Rail train services to Wembley Stadium, with a journey time of less than 10 minutes. All of the rooms have Sky satellite TV, telephones, hairdryers and tea/coffee. Each en suite bathroom has a bath and power shower. Cots, irons and ironing boards are available on request. A continental breakfast is available every day and the bar and restaurant offers drinks and cocktails alongside freshly cooked food. This newly-built hotel is close to Harrow, Wembley Exhibition and Conference Centre, and the new Wembley Stadium, and is a short train ride from central London. The Brent X Hotel in North-West London is a strategic hub suitable for business travellers to North London and tourists visiting the capital city. It is close enough to central London for a day trip, yet far enough to avoid the city's noise and traffic. Comfortable, spacious en suite rooms are available at very affordable prices. The hotel has a spacious, bright and airy dining room, a garden, a wireless broadband facility and off-street car parking. Professional staff are at hand to help you at all times. The hotel is walking distance from Preston Road and the Kingsbury roundabout, which offers cafes, restaurants, health clubs and shops. Just 150 metres from the Excel Exhibition Centre, Ibis London Docklands Excel offers excellent value accommodation, overlooking the Royal Victoria Dock. The hotel is easily accessible via the Docklands Light Railway. Ibis Docklands Excel boasts comfortable, modern rooms with en suite facilities. Each room has an air cooling system and satellite TV. The hotel features a bar with Sky Sports, where guests may relax. Enjoy a meal in La Table restaurant. There is also a 24-hour Welcome and Snack service. The hotel is just a few minutes from London City Airport, Canary Wharf and historic Greenwich. 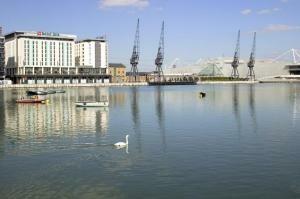 Ibis London Docklands is near to the O2 Arena and only 30 minutes from Central London. Ibis Docklands Excel has 11 rooms with accessible facilities. Savoro Restaurant with Rooms offers 11 bedrooms decorated in contemporary taupes browns and creams. Our deluxe rooms boast walnut floors, modern four poster beds, LCD televisions- the perfect place to unwind after dinning with us. Our seven standard rooms offer affordable and comfortable accommodation with heavenly beds and impressive power showers. Wi-Fi is available throughout, and free parking is also available. A few minutes south of Twickenham High Street, The Alexander Pope Hotel is a modern, fully air-conditioned hotel with a traditional pub, overlooking the River Thames. The Alexander Pope Hotel is close to Kingston, Wimbledon, Richmond and is only a short walk from Twickenham rugby stadium. Strawberry Hill, with trains to London Waterloo every 20 minutes, is just a 5-minute walk. The 3-star Alexander Pope Hotel has en suite bedrooms, some with sofa beds to accommodate families. Many rooms overlook the Thames and several also have a balcony. A wide selection of traditional and modern dishes, including seasonal specials, are available in the traditional pub, which also serves Young's beers and lagers. The hotel also offers a conference room for small meetings or gatherings. Set in 40 acres of stunning gardens, Grim's Dyke Hotel is 12 miles (19.3 km) from London's West End and Heathrow Airport, with excellent access to the M1 motorway. All rooms have traditional, elegant decor, en suite facilities and satellite TV. Some of the Period Rooms have four-poster beds and stunning garden views. Free Wi-Fi internet access is available in the hotel. Awarded 2 AA rosettes, Gilbert's Restaurant serves an excellent menu, with features including a magnificent inglenook fireplace and views overlooking the croquet lawn and rose garden. 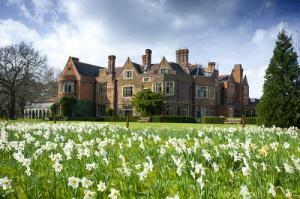 Grade II Listed Grim's Dyke Hotel boasts a grand entrance hall and traditional Library Bar, with a huge fireplace. This tranquil room overlooks the croquet lawn, terrace and gardens. 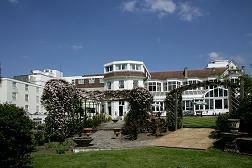 This 3-star Silver Award country house hotel is just 8 km from Wembley Stadium. Only a 10-minute drive away is Grim's Dyke Golf Club, with a picturesque parkland course. The prestigious Harrow School is also nearby. A few minutes' walk from Richmond town centre and rail/Tube stations, the cosy, popular Red Cow is a restored inn offering home-cooked bar food and comfortable accommodation. The Red Cow has a history that dates back to the early 19th century. Although recently refurbished, many of the original features, including wonderful glassworks, have been retained. Richmond Station has frequent rail services to Central London, and the Tube station is connected to the District Line and London Overground Line. Only 1.25 miles (2 km) from Heathrow Airport and with a free regular public bus service to all terminals, this luxurious 4-star hotel offers spacious rooms and a stunning indoor pool. The Sheraton Skyline Hotel & Conference Centre has some of the largest bedrooms in the area, with large and luxurious beds. Classic, Family and newly renovated Club Rooms are available. The Club Rooms include exclusive access to the Club Lounge with its free breakfast, all-day refreshments and high-speed internet access. The award-winning Al Dente Ristorante offers Italian fine dining, with menus that mix tradition with creative flair. Alternative dining options include Al Dente Lounge and the Sports Bar & Grill. Re-opened in April 2009, the acclaimed Sky Garden, Sky Bar and Pool features an indoor pool and a cocktail bar surrounded by tropical plants. Sheraton Fitness has 24-hour gym access. Enjoy 1 hour's free internet access with The Link @ Sheraton in the lobby. 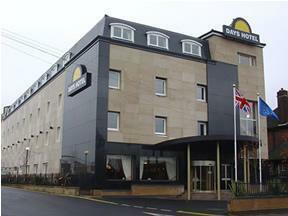 The ParkHouse Hotel has budget en suite rooms and free parking. It is a few minutes' walk from Harrow town centre, shopping malls and Harrow-on-the-Hill Tube and rail stations. ParkHouse Hotel is 10 minutes from Wembley and 20 minutes from Central London. 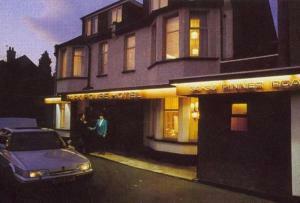 The ParkHouse Hotel is an extension of The Harrow Hotel and offers accommodation to guests with a lower budget. Harrow Hotel is 50 metres away and Park House guests may use its main facilities, including LanFrancs restaurant and a bar. Breakfast can be taken in LanFrancs restaurant. West Lodge Park is a charming, country hotel retreat set in 35 acres of tranquil parkland just 12 miles from Central London and a mile from J24 of the M25. The family-run West Lodge Park with its 2 AA Rosette restaurant is ideal for those seeking peaceful accommodation without sacrificing easy access to North London and Hertfordshire. All rooms are individually decorated with modern conveniences, including wireless internet. Some rooms have four-poster beds, others have a terrace or overlook the extensive gardens. The hotel's beautiful parkland is home to the National Collection of Hornbeams and over 800 different shrubs and trees from around the world. Located next to Regent's Park, Melia White House is a smart and well-located hotel with luxurious rooms. Oxford Street and Piccadilly Circus are within walking distance. L'Albufera restaurant offers fine Spanish cuisine, and The Place restaurant is ideal for a light, informal meal. As well as relaxing, elegant rooms, Melia White House has a fitness centre, 24-hour room service and a business centre. Melia White House is well served by 3 underground stations: Warren Street, Great Portland Street and Regents Park. One of the most convenient hotels for accessing Heathrow Airport or Central London, this smart, modern hotel is 10 minutes from Heathrow and opposite Feltham Rail Station (25 minutes to Central London or Windsor). Regular public bus services connect Feltham to Heathrow Airport (bus stop opposite hotel). Route 285: a 24-hour service to Heathrow Central Bus Station for terminals 1, 2 and 3. Route 490: operates from 06:00 - midnight to terminals 4 and 5. 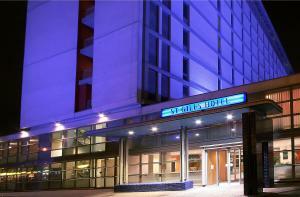 Each room has air conditioning, soundproof windows and Wi-Fi, and St Giles has its own restaurant and bar. The hotel is within easy reach of Twickenham Stadium, The Stoop, Kempton Park Racecourse, Kew Gardens, Thorpe Park, Hampton Court, Legoland and Windsor. A cinema, bowling, restaurants and bars are within walking distance. Near to Regents Park and London Zoo, this luxurious North London hotel with a large swimming pool is set in the peaceful suburbs of Camdens Swiss Cottage. 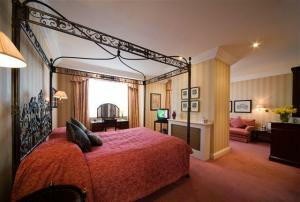 London Marriott Hotel Regents Park is close to the Tube and has easy access to London attractions. Nearby are Lords Cricket Ground, and St Johns Wood and Primrose Hill, which have exclusive shops, bars and restaurants. The hotel is outside the Congestion Charge Zone. Other on-site facilities at the Marriott Regents Park include a gym and a health and beauty salon (booking required, additional cost). Dine in the French Brasserie Central, or Chats Caf? Bar. With an 18-hole golf course and a swimming pool, this relaxing hotel is set in 205 acres of parkland, 13 miles (21 km) from Central London and a 25-minute drive from Gatwick Airport. Located southeast of Croydon, Selsdon Park & Golf Club offers breathtaking views of the North Downs countryside and is a 45-minute journey from Heathrow Airport. The air-conditioned Cedar Restaurant overlooks the terraces and gardens and the chefs present an exceptional range of dishes. Light meals are available daily in Tempus Bar. 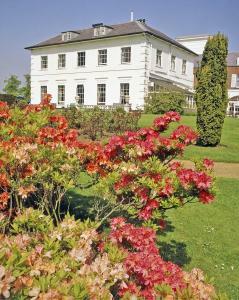 Selsdon Park has 26 conference and meeting rooms catering for up to 350 delegates. There are also 4 Motivator Suites. Set in 4 acres of stunning gardens, Warren House is a Grade II Listed building, a 5 minute walk to Richmond Park and 10 miles (16 km) from Central London. Warren House boasts a range of superb amenities, including an indoor swimming pool and a gymnasium with modern fitness facilities. There is a Billiards Room with snooker table and a croquet lawn in the idyllic grounds. Each stylish, individually decorated room is elegantly furnished and has a flat-screen TV, wireless broadband access and a Bose CD music system. There are several private rooms that guests may choose to dine in, offering cuisine that uses local and organic produce; some taken from the orchards and meadows in the grounds. A 19th-century Victorian mansion, Warren House is also a perfect venue for conferences, meetings and events.